Lionel Messi and Argentina will be fighting for their World Cup lives on Tuesday as the South American heavyweights take on Ecuador aiming to avoid a humiliating failure to qualify for next year's finals in Russia. The eyes of the football world will turn to Quito's Estadio Olimpico Atahualpa to see if the once unthinkable prospect of a World Cup without Messi is to become a stunning reality. The two-time World Cup winners head into the final round of South American qualifiers in sixth place, outside the top four positions which grant automatic qualification and trailing fifth-placed Peru, who occupy the playoff spot, on goal difference. 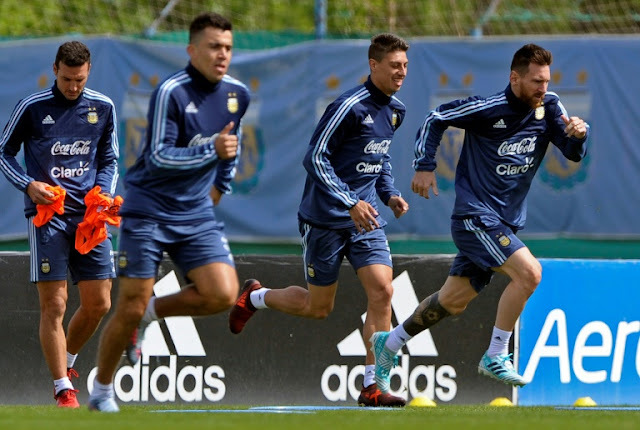 Argentina can simplify the equation for their nervous fans, however, if they manage to take all three points in Quito on Tuesday. A victory would guarantee they finish no worse than fifth place, putting them into a two-legged play-off against New Zealand they would be expected to win. But winning in the thin air of Quito, which is 2,850 metres (9,350 feet) above sea level, may be easier said than done. Barcelona star Messi also has a record of struggling in games at altitude, vomiting on the pitch during a draw in the rarefied air of Bolivia four years ago. The 30-year-old five-time Ballon D'Or winner also heads into the game knowing that next year's finals in Russia may be his final chance to emulate Diego Maradona by winning a World Cup. "A World Cup without Argentina and without Messi would be a catastrophe," Argentina's 1978 World Cup hero Mario Kempes said this week. "The only ones who would be happy if Messi doesn't go to the World Cup would be Maradona fans." The 2014 World Cup finalists face their moment of truth after a series of uninspiring performances that has left the footballing world scratching its head at how a squad bristling with so much attacking talent has found scoring so difficult. Despite being able to call upon Messi, Sergio Aguero, Gonzalo Higuain, Paulo Dybala, Mauro Icardi and Angel Di Maria throughout the campaign, Argentina have only scored 16 times in 17 games. For some Argentines, the troubles of the national team have been a long time coming. Sergio Batista, a member of the 1986 World Cup-winning team, was scathing in his assessment. "Argentina is all at sea. But this didn't happen recently. It's the end of a movie I've been watching for 10 years," Batista said. "I believe in projects and planning, but in our football, there's nothing. Seven managers in 10 years? And three in a single qualifying campaign? It wouldn't happen anywhere else." Elsewhere on Tuesday, Chile could seal their qualification with victory over Brazil in Sao Paulo. Brazil have already qualified for the finals and are guaranteed top spot. Uruguay meanwhile need only take a point in their home qualifier against already-eliminated Bolivia to be certain of progressing. One of the most high-stakes games comes in Lima, where Peru will aim to qualify for their first World Cup finals since 1982 when they take on Colombia. Colombia were moments from qualifying for the World Cup last Thursday before two last-gasp goals from Paraguay turned a 1-0 win into a 2-1 defeat. That win kept Paraguay's qualification bid alive and a home win over Venezuela on Tuesday could see them seal their place to Russia depending on results elsewhere. 0 Response to "Make or break for Messi and Argentina in World Cup qualifier"